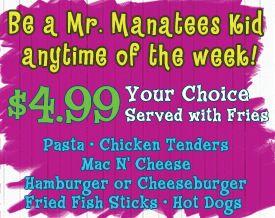 Mr. Manatees - Vero Beach’s Favorite Casual Restaurant! Vero Beach’s Favorite Casual Restaurant! 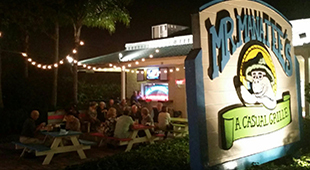 From the moment you walk in the door at Mr. Manatee's, you feel that you've changed latitude and attitude! The serene yet surreal mural images set the Key West mood for relaxed food and fun in an island atmosphere! 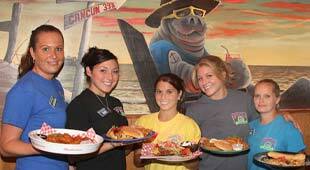 Woodrow the friendly resident manatee welcomes you to enjoy daily specialties and weekly dinner specials! 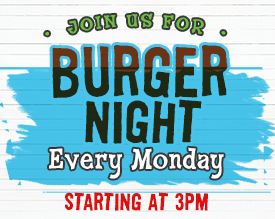 Enjoy island favorites like Cracked Conch, Onion Crusted Dolphin, Crab Cakes, Tuna Steak and more! Some guests come to enjoy the drink specialties, then make a meal of the ample appetizer plates. Raw or Steamed Oysters .59¢ ea. Award Winning Wings .59¢ ea.